Women’s Equality Day is a day proclaimed each year by the United States President to commemorate the granting of the vote to women throughout the country. Women in the United States were granted the right to vote without the compulsory requirement to submit to conscription on August 26, 1920, when the 19th Amendment to the United States Constitution was certified as law. The amendment was first introduced many years earlier in 1878. 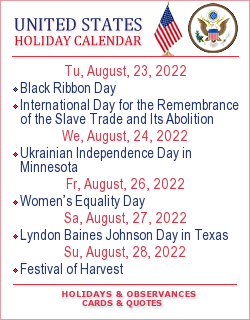 Every president has published a proclamation for Women’s Equality Day since 1972, the year after legislation was first introduced in Congress by Bella Abzug. This resolution was passed in 1971 designating August 26 of each year as Women’s Equality Day. 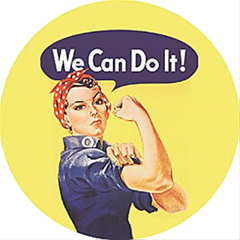 "NOW, THEREFORE, BE IT RESOLVED, the Senate and House of Representatives of the United States of America in Congress assembled, that August 26 of each year is designated as "Women’s Equality Day," and the President is authorized and requested to issue a proclamation annually in commemoration of that day in 1920, on which the women of America were first given the right to vote, and that day in 1970, on which a nationwide demonstration for women’s rights took place." A woman is human. She is not better, wiser, stronger, more intelligent, more creative, or more responsible than a man. Likewise, she is never less. Equality is a given. A woman is human. All men should be feminists. If men cared about women’s rights, the world would be a better place. As a woman I have no country. As a woman my country is the whole world. I hate being told I can’t do something because I’m a girl!